Mother Lode Rose Society | Located in the heart of the historic Gold Rush country. An affiliate of the American Rose Society, we offer educational programs and activities, Rose Shows, and proudly maintain the Rose Garden at the Amador Senior Center. 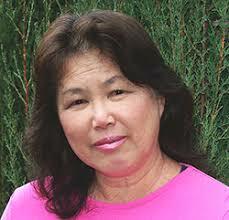 Our speaker for the April 2nd Mother Lode Rose Society meeting is Burling Leong. She is the owner of Burlington Rose Nursery in Visalia. The nursery opened in 2002. Before that, Burling was employed by Sequoia Nursery for 35 years. She will be speaking to us about Rose Propagating. Her expertise is unlimited. She has been involved in the restoration of the rose gardens at Hearst Castle and Will Rogers State Park. Burling is currently working with additional restoration at Hearst Castle and custom propagation of ramblers and other types of roses for Brooklyn Botanic Garden in New York. In the near future she will be working to restore tree rose standards at Rancho Los Alamitos Park in Long Beach, CA. Please come join us, we are lucky to have such a knowledgeable and experienced presenter. Thank you! Annual Rose Auction on Feb 23 was big success! This year’s auction features a gorgeous line-up of roses! Check out slideshow of this year’s beauties. See Rose Auction page for more info including descriptions. The Mother Lode Rose Society is a friendly group! Join us to learn more about rose growing in our neck of the woods. Mother Lode Rose Society membership for 2019 only $20 individual or $25 per family. Renewing ASAP insures you will be included in the MLRS Directory. Make checks payable to MLRS and send to Mother Lode Rose Society, PO Box 7, Plymouth, CA 95669. For membership and renewal forms, see Membership page or click here. Join the American Rose Society. Members receive “The American Rose” magazine, the handy reference “Handbook for Selecting Roses” and other valuable resources. See www.rose.org for more info.